BOSTON – May 12, 2016 – Nift the first invitation-only network that helps neighborhood businesses bring the right new customers through the door, today announced that it has raised a $3 million round of venture capital funding. The seed round, led by Spark Capital and Accomplice, will enable Nift to expand its network of local businesses and continue enhancing the technology that powers it. Nift is a network of businesses like restaurants, boutiques, hair salons, spas, gyms and locally-owned stores that are the engines of local economies and sustain a neighborhood's character. Business owners use Nift to thank their best customers with a complimentary, full-value gift to another local business. As a business owner, when you give a Nift gift you'll help one of your customers discover a great neighborhood business. In return, another business will give their best customer a Nift gift, helping them discover your business. Justine Deutsch Myers, owner of Acupuncture Together in Cambridge, is one of hundreds of businesses already growing with Nift in the Greater Boston area. Nift is built on sophisticated, proprietary technology that matches the best customers with gifts from non-competitive businesses. It also ensures fairness, so the value of Nifts that one business gives is equal to the value of Nifts their customers receive in return. On June 21, the company will hold the Nift Neighborhood Giftfest. That day, an estimated 5,000 employees at more than ten leading companies in the Greater Boston tech community will arrive at work to find a “Thank You” from their employers in the form of a Nift. Everyone receiving a Nift that day will be treated to a fully-paid gift at a participating local business. Toast, a leading restaurant point-of-sale company headquartered in Boston that employs more than 200 people, is one of the participating companies. 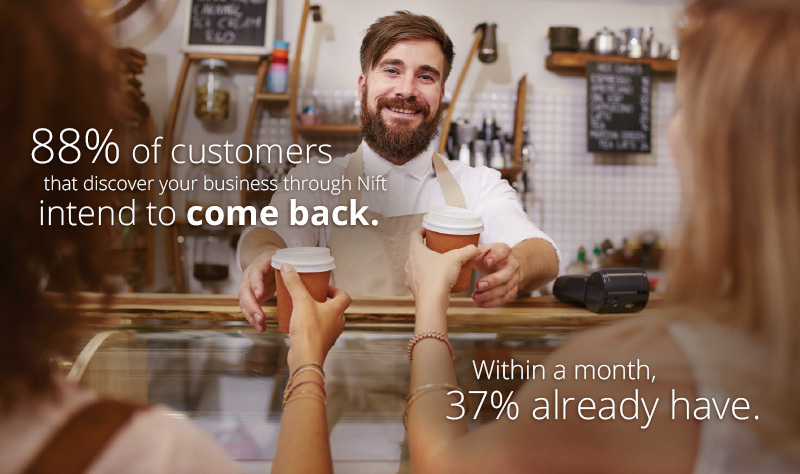 Nift is the first invitation-only network that helps neighborhood businesses get the right local customers to walk through the door. It's the only network that guarantees businesses are discovered every time they thank their best customers. Nift, short for “neighborhood gift,” was founded in Brookline, Massachusetts and was developed in collaboration with the local businesses it was established to help. For more information, visit www.GoNift.com or follow @NiftNetwork on Twitter.